4" square steel tubing is crafted into the strong dual pedestal frame with bench support arms that offer a modern twist to the simple, classic picnic table design. The all steel, dual pedestal picnic table an ultra-popular choice for durable, outdoor picnic table solutions. Engineered for harsh weather durability, the MIG welded frame protected with an anti-corrosive powder-coating finish ready for continued exposure to everyday weather conditions. 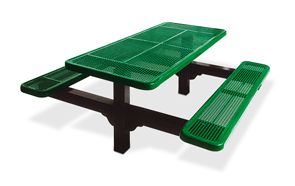 The structurally sound table top and benches are constructed with 12-gauge die-formed	perforated steel that is tied together with a smooth, solid 11-gauge 3" edging. Finished in a UV stabilized, impact resistant thermoplastic coating, all resulting in a safe, inviting surface that will maintain its original look. Great for parks, schools, food environments and open community spaces, the 6', 8' and Universal Access tables are available in surface and in-ground mount styles. The 8' ADA compliant rectangular dual pedestal table provides two universal access seating options.